A great way to finish the triathlon season. 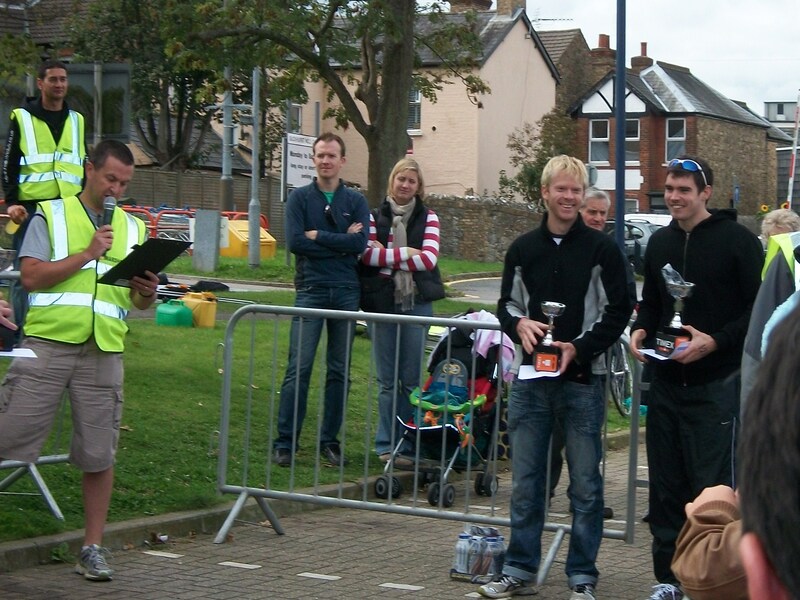 Apart from the two Ironmans, I’ve only managed to do three triathlons this year, but I’ve podiumed (Top3) all of them. 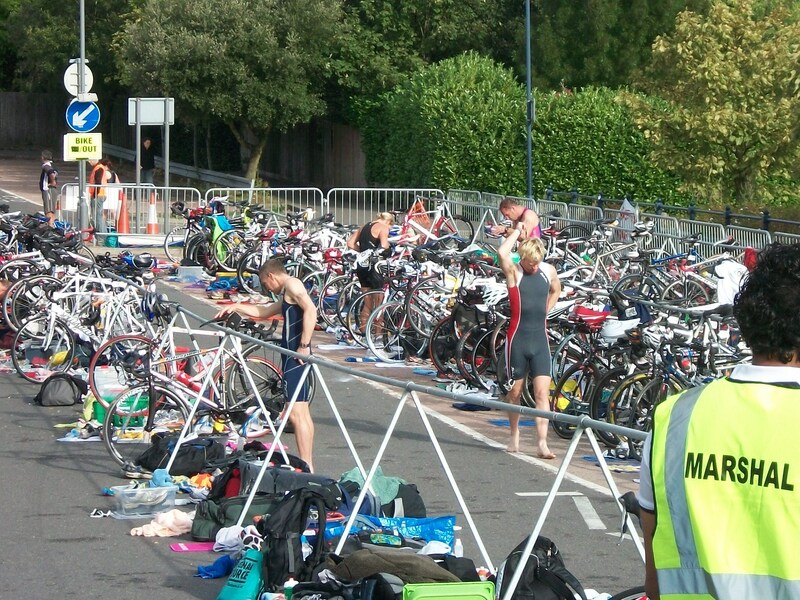 Unlike the first two races this was a sprint event comprising – 400m pool swim, 25km bike and a 5mile xc run. I’ve taken part in this event a few times over the years. It’s grown to become an award winning (220) race of around 350-400 competitors and has gone through a few (run) course changes. My previous best was 1:23:30-1:24:00 on the old course. 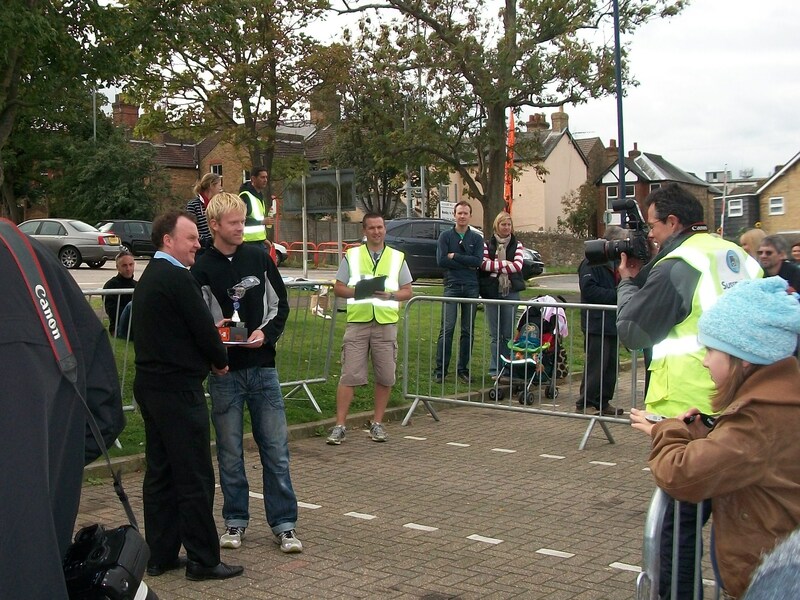 On the current format I did around 1:24:30 in April 2009, finishing 4th. It was disappointing at the time because the chain had come off the bike on a steep uphill section and I’d had to slow down and stop a couple of times on the run from stomach cramping. In fact I’ve had stomach cramps a few times over the years. I’ve put it down to aggressive cycling and running on a hilly course at threshold+ effort – something I lack in my training. I generally train on the flat at sub-threshold levels. So this year my main aim was to get around in a decent time and see where that left me. A time of <=1:22 is usually good enough to get you a Top3. After a fair amount of deliberation I went for the Argon bike with a pair of Planet-X wheels. The Ceepo would have been twitchy on the fast descents and corners. I would have gone with the Sub9 disk but for the state of the roads in some places. I’d rather damage a PX82 than a Zipp! I raced in my Spiuk Evo tri-suit and used Asics hyperspeed2 racers. I was tempted to lace-up some inov8 roclites because the run is off-road and quite stony in parts. With a 9:45am start I had plenty of time to get ready and drive down with Yve. 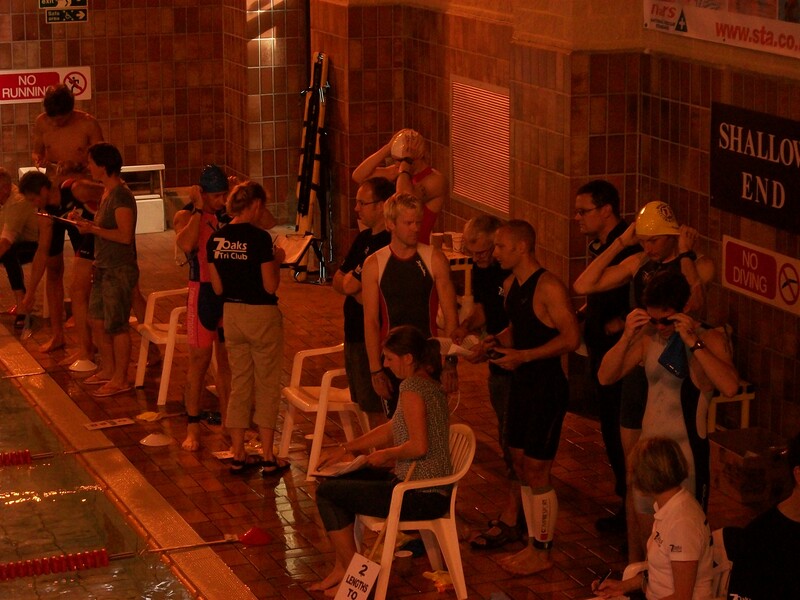 The race had already been underway since 6am, with the faster swimmers starting later in the day. Was great to meet Marianne and Justine, Mike and Team Outrageous, and some fellow competitors in the lead-up. No major problems before the race apart from having to hunt down a decent track pump (my current one is on its last legs) and only having a short warm-up. Arrangements were being made to set 10 of us off in one wave to make it a bit more exciting. I recognised one or two names from the past (eg Gary Bryant, Mark Whittaker) and was expecting them to finish on top by the end of the day. Ade Grimmond is also a member of Team Outrageous and an awesome swimmer. He’s usually doing <50mins Ironman swims so I expected him to be one of the first out of the pool. I shared a lane with a guy looking for 6mins. The lane to our right had Ade, and Neil Harris, who was looking for a 5min swim. From the off I worked quite hard to stay with those around me and knew it wasn’t going to be pretty as my swim form is not good. I managed to run out of the pool in front of the guy who shared my lane, and right behind someone else. There was a pair of Bloc sunglasses up for grabs for the quickest T1 which I had in mind, but couldn’t get past the guy in front to start with. When I reached my bike I spent 5 secs struggling with the number belt and gave up when I saw the other guy fly out ahead of me! I did 48secs in T1 – the winning split was 40secs. I didn’t realise at the time that I’d started the bike in 4th place. The person directly in front of me was having problems getting on his bike at the mount line, so I did a running jump and led out the first corner. The first few miles out of Sevenoaks are uphill but I really wanted to make some ground on the faster swimmers, so I worked hard. I passed Ade after about 4mins and was temporarily in 2nd behind Neil Harris (who’d done a 5:19 split for the swim and part of T1). On the approach to Hildenborough I was overtaken by a guy on a TT bike kitted out with a disk and Speedfil bottle. I wondered at the time what difference it would have made if I’d done the same thing. If anything this did me a favour as I had someone to pace to. I tried to keep within 50m of him for the rest of the race. At halfway and the approach to a long tough climb, I was overtaken again. This time by Mark Whittaker. I tried to pace to him last year before my chain came off, when he went on to win in 1:19. I was hoping they might tire on the hill so I bided my time. Mark sustained the pace really well and pulled further away, whereas the other guy struggled a little. Only enough for me to go past him temporarily, before he found his legs again and came back. I stayed within 50m of him before we reached Sevenoaks and T2. Not a bad transition, although I wasted a few secs sipping coke on the exit. After a steep descent into Knole Park I started working on closing the gap to the guy in front. I caught him after 400m and then spent the rest of the 5mile run working hard on the hills around the park. My 32min time in hindsight is a little slower than I would have liked. I thought I had paced it well and made the most of the downhills, but without decent pacing it can make you lazy at times, especially when running past slower runners. Overall it was probably a little slower than last years run (without the stops), although I took a good 2mins off last years bike split. I didn’t know at the time that I was closing in on 2nd place. He was just 100-200m ahead of me on the exit from Knole Park and beat me by 16secs. 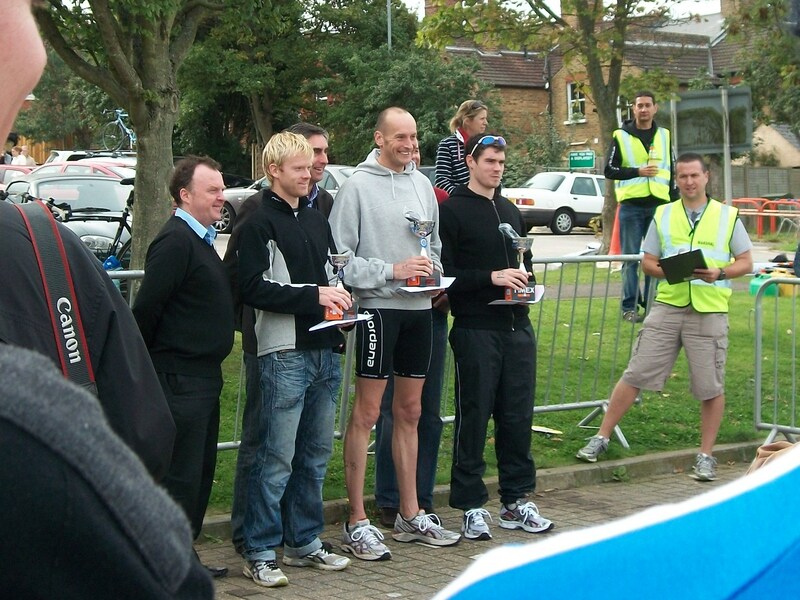 Neil had won Crystal Palace Triathlon earlier in the year so is on good form. Mark Whittaker had an awesome race, finishing in another 1:19 time. Apparently he’d also swum 2 lengths too many, and flipped over his bike on the mount-line! He deserved the win. Considering I’m just a few weeks into my new training plan I’m very pleased with the overall performance. I came away with a trophy, Timex watch, Bloc sunglasses, Road ID and (6x) For Goodness Shakes. There were plenty of spot prizes being handed out too, including a laptop, bike box, training-camp holiday, free race entries, etc. I’m just starting a Level3 (most hrs in a 4-week training block) week which will include 2-3 long bike rides. Then I’ll have a couple of broken weeks continuing the high-mileage theme, before a one week holiday in Malta. This will be a complete break from training (well a few sea swims and local beach runs don’t count!). After that I will only have 2-3 training blocks before the end of the year. Sevenoaks always has special place for me, although I’ve too far away to compete there now. nice work daz. i’ll have to do this race one year. Excellent report. Great insight. I’m doing this race next year and hope to do it some justice. You certainly have. Looks like my bike leg will need some work. Nice one Mark! Yes it’s a great event – well organised and sponsored, with a demanding but fun course. You’ll love it.